Introducing the all-inclusive weight-based grinder, the Vario-W uses real-time weight-based grinding with a built-in scale. Building upon the success of the Vario coffee mill, Baratza has added a load cell to precisely weigh the coffee as it grinds. To make grinding coffee easier than ever, the Vario-W allows you to select the weight you desire, and the machine takes care of the rest by grinding and stopping automatically. Included is an easy to use control panel that has three programmable dosage buttons and a digital LCD window to display weight values. ** $15.00 shipping discount to Hawaii and Alaska code SHIPDISC during checkout. Canada code SHIPDISCC. Rather than manually weighing beans, the Vario-W is an inexpensive and accurate method of weighing and grinding beans all in one. With the ability to grind 1.5 g/second at espresso and 2.5 g/second at French Press, this is now the quickest and most reliable way to grind coffee. Similar to the Vario this new product includes a small footprint, macro/micro adjustment, 54 mm ceramic burrs, broad grind ranges, but instead of being time-based, it uses a weight-based approach to grinding. The Vario-W can be a good solution for espresso bars, small shops and, of course, home users looking for the highest quality available. The Vario fills the niche between large professional grinders and home grinders. It has a small footprint, full grind range, precise dosage by weight, rapidly repeatable micro grind adjustment and quick grinding speed. This mill will provide repeatability and consistency. 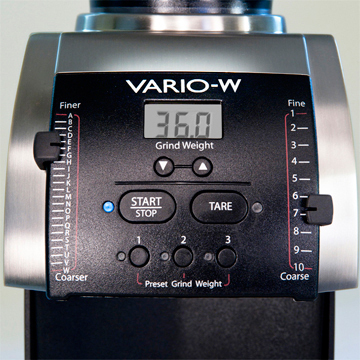 The Vario-W is a fully integrated weight-based grinder. Baratza's groundbreaking Vario-W uses real-time weight-based grinding with a built-in electronic scale. Set the weight you want, the Vario-W does the rest, weighing the ground coffee to within +/- 0.2 g, while grinding, and stopping automatically. No more need to manually pre-weigh your beans. The Vario-W weighs the ground coffee then automatically stops the grinder. Ideally suited to about 50-60 cups of coffee a day (about 2 lbs of coffee). The Vario has the performance of a large grinder without the need for all the counter space. Measuring only 5� wide and 7� deep it will fit on almost any counter. At only 14.5� tall, it fits under overhead cupboards. All functions are controlled from the front, so walls or equipment directly beside it is not a problem. Ceramic 54mm professional flat burrs manufactured in Germany by Mahlkönig. Produces accurate grinding with high throughput and burrs remain sharp for up to twice the lifetime of the highest quality steel burrs. Fine grind tuning . Macro and micro adjustments are instantly and repeatedly achievable with the intuitive Vario adjustment system. The Vario offers 230 distinct settings of grind to satisfy even the most demanding coffee connoisseur. The broad range of grind (250 mm to 1200mm) and the narrow particle distribution (bi-modal in espresso setting) are hallmarks of the professionalism of the Vario. The Vario-W uses an easy and intuitive operation panel that includes three programmable dosage buttons, and a digital LCD window which displays the weight value. Simply press the START button, and the Vario automatically delivers precise weight based dosing. The Vario grinds 1.5 grams/second at Espresso and 2.5 grams/second at Press. The speed of grind is truly Professional. The Vario employs a high torque DC motor and an ultra-quiet belt-drive transmission. The German timing belt provides important thermal isolation of motor and burrs, ensuring cooler coffee. 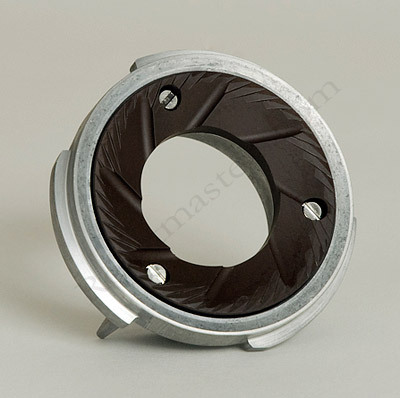 This Vario-W model does not come with the Portaholder that is furnished with the regular Vario. Because the grind dosage is based on weight rather than volume, ground coffee goes into the bin, which sits atop the built-in scale. Roastmasters offers the Baratza's Vario coffee mill at the lowest price allowed.